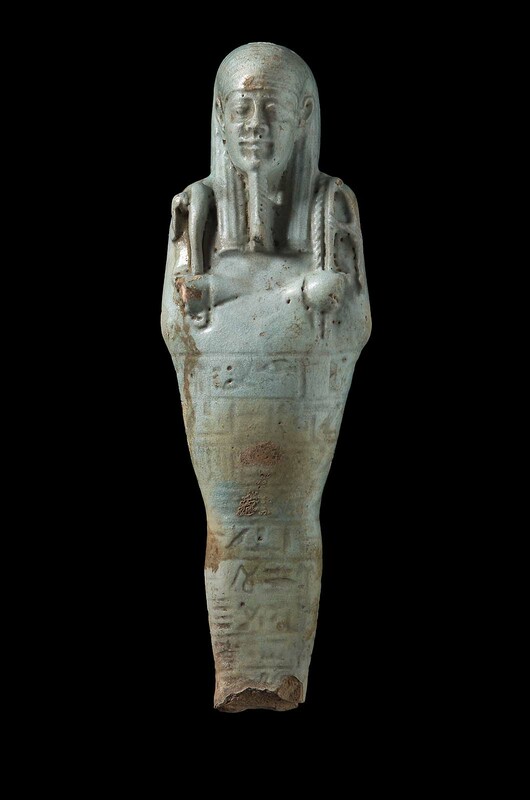 This shawabty dates to the Late Period and is inscribed for Tasheri-ihet born of Mertefnut (mr-Tfnwt). The typology of this period consists of a tripartite wig, long beard, back pillar and base, with the figure holding the pick on the right shoulder and hoe and cord to a small seed bag on the left. Here the arms are crossed right over left. There are approximately nine horizontal lines of incised text encircling the body, ending at the back pillar. The tripartite wig has incised lines denoting tresses and the beard is plaited. The beard is executed in open work, and is not attached to the neck. The lower part of the legs, feet and base are missing.